Viknesh Vijayenthiran January 10, 2013 Comment Now! 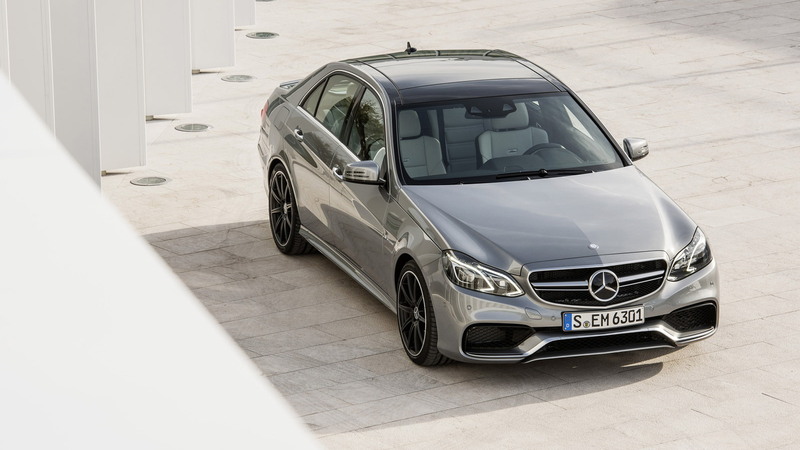 Following the recent reveal of its new 2014 E Class range, including the new Coupe and Cabriolet models, Mercedes-Benz has now taken the wraps off the model we’ve been dying to see, the 2014 E63 AMG high-performance sedan and wagon. The high level of anticipation was due to the aggressive new styling AMG promised to deliver on its new E63, and after a quick glance at these initial shots we’re glad to see the Affalterbach tuner has stayed true to its word. 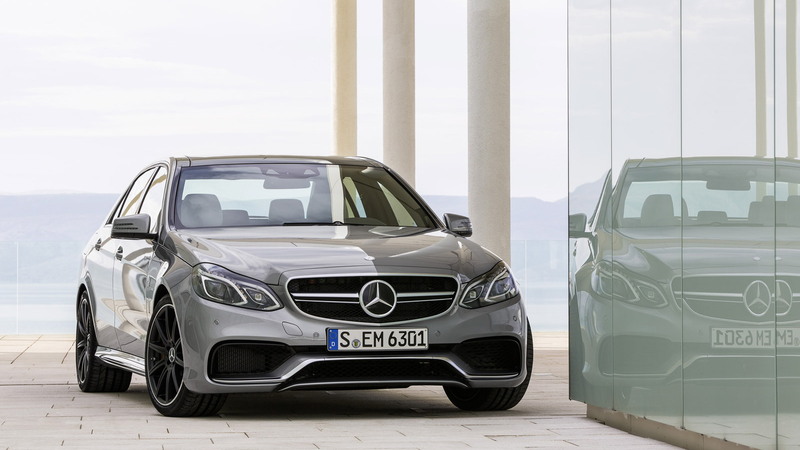 The latest E63 AMG features the most aggressive lines we’ve seen yet on one of its models, particularly the front section which now mimics the look of a DTM race car. Key elements include the new ‘twin blade’ radiator grille and a new ‘A-wing’ front bumper. 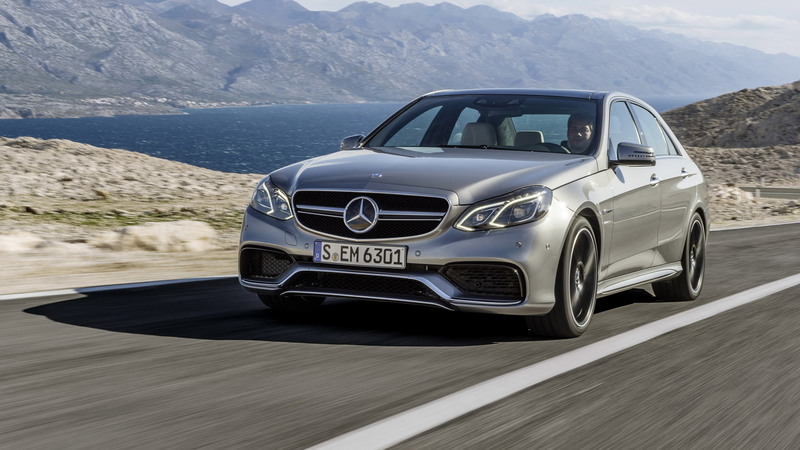 The big news, however, is the addition of 4Matic all-wheel drive on the E63 AMG, which for customers in the U.S. will be standard. That’s right; the car won’t be available with rear-wheel drive for customers in AMG’s most important market. AMG is keen to stress that its version of 4Matic isn’t the same as Mercedes’ system, but is instead a lighter and more performance-oriented setup. 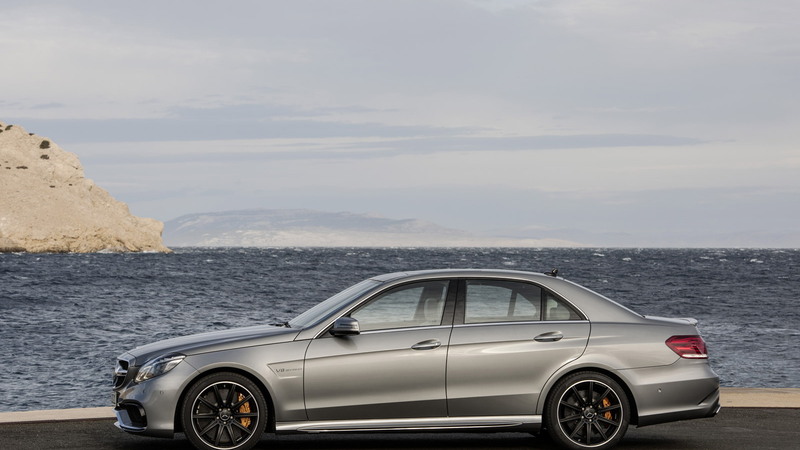 The 2014 E63 AMG represents the tuner’s latest step towards a full all-wheel-drive lineup as a response to the ever increasing amounts of power and torque with each new model introduction. Another change in the lineup is the addition of a new range-topping S-Model. Its output registers at a heady 577 horsepower and 590 pound-feet of torque. The regular model, meanwhile, also sees its output rise to 550 horsepower and 531 pound-feet of torque. The car’s cousin, the CLS63 AMG, also gets standard all-wheel drive in the States, as well as the availability of the new S-Model. Delivering all that power is once again AMG’s twin-turbocharged 5.5-liter V-8, which is matched to the AMG Speedshift seven-speed automatic transmission. Four transmission modes are available, "C" (Controlled Efficiency), "S" (Sport), "S+" (Sport plus) and "M" (Manual), along with rev-matching on downshifts and launch control. The quickest model, the E63 AMG 4Matic S-Model Sedan, needs just 3.5 seconds for the 0-60 mph sprint and can easily reach its limited top speed of 186 mph. AMG’s 4Matic all-wheel-drive system features a 33-67 front-rear torque split, offering the rear-biased feel we all love but with the added traction of all-wheel-drive when roads get slippery. The system relies on a transfer case integrated with the gearbox. Torque is transferred to the front wheels via a second drive shaft and front differential. The added weight of the system is approximately 154 pounds. The three-stage electronic stability is specifically calibrated to this 4Matic system. In "Sport Handling" mode torque vectoring using brake pressure is applied to individual wheels, helping to alleviate the understeer typical of all-wheel-drive vehicles. 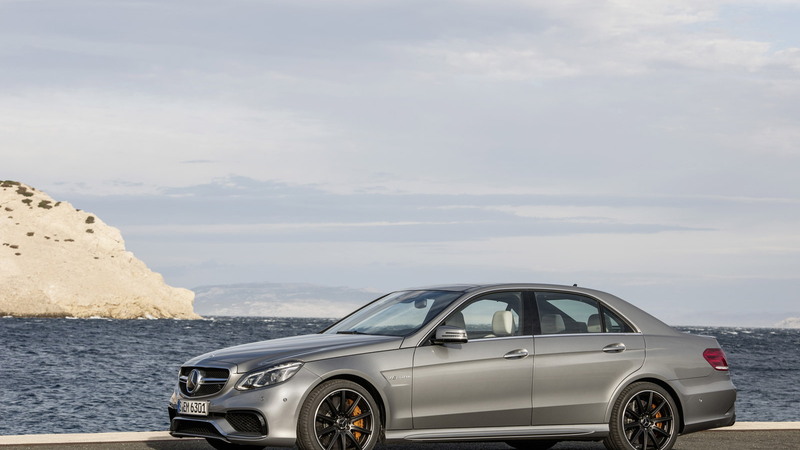 Mercedes-AMG goes even one step further on the E63 AMG 4Matic S-Model. This model also gets a limited-slip rear differential. All models, meanwhile, get adaptive suspension, controllable by the AMG Drive Unit fitted inside the cabin. Here the driver has the choice of "Comfort" or "Sport" or "Sport plus” modes. Also aiding the handling of the E63 AMG is a 1.9-inch wider track compared to the regular E Class on which it’s based, AMG-tuned electric power steering, 19-inch AMG light alloys and an available carbon-ceramic brake package. Inside, you’ll find plush materials, grippy sport seats, and plenty of carbon fiber and aluminum trim to remind you of the car’s sporting prowess.The grip areas of the black Nappa leather steering wheel rim with flattened top and bottom is finished in Alcantara with gray contrasting seams. A redesigned AMG instrument cluster replaces the standard unit, and is joined by an IWC-inspired analog clock and an available Bang & Olufsen premium sound system with 14 speakers. First sales of the 2014 Mercedes-Benz E63 AMG sedan and wagon commence this summer, but in the meantime stay tuned for our live photos and video of the car following its debut next week at the 2013 Detroit Auto Show.